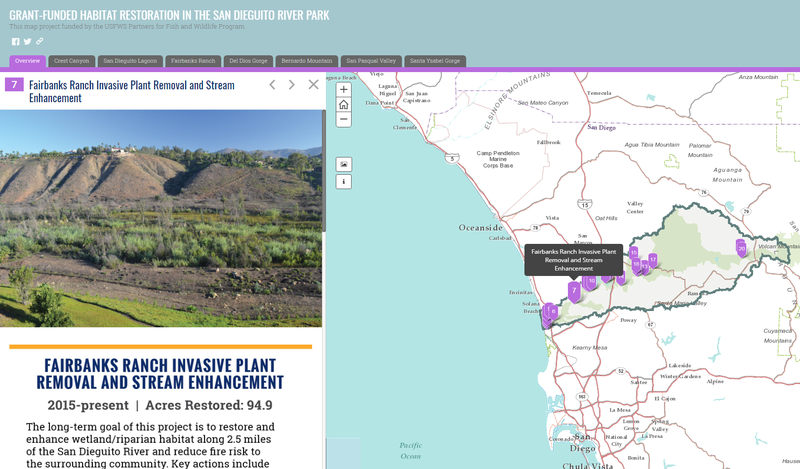 The long-term goal of this project is to restore and enhance wetland/riparian habitat along 3 miles, 200 acres, of the San Dieguito River and reduce fire risk to the surrounding community. Key actions include non-native, invasive plant removal, revegetation with native species, volunteer training, community workshops and education of local residents on how to improve habitat and create Fire-Safe landscapes around their homes. A secondary goal of this project is to highlight the importance of diverse partnerships in conserving habitat along the San Dieguito River. For more information, go to: http://www.ranchosantafereview.com/news/local-news/sd-cm-rsf-restorationproject-20171101-story.html.